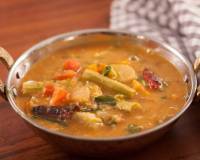 Goan Lady Fish Curry, a delicious Curry that can be made in jiffy and is perfect for your weekday meals. It is made in almost all the Goan households. 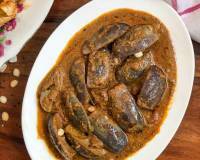 No coastal cuisine is complete without fish curries. 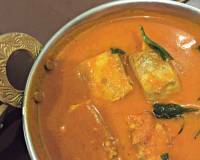 In Goa, fish curry will be cooked almost everyday for lunch. 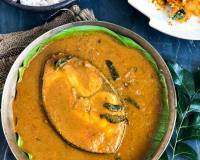 Since various types of fish are available in Goa, various types of fish curries can be made and the recipe differs according to the type of fish used. Note that in this recipe no sichuan pepper (teffal) is used, but in Mackerel, Sardines and seerfish curries it is used. Similarly in Goa the cuisines differ too. Some people add garlic to fish curry and some people don't. Lady fish is a very clean fish and we absolutely love to eat this. It is one of the tastiest fish. 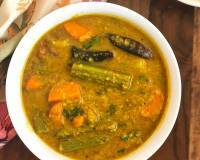 It is known as "Kane" in Mangalore and "Muddoshi" in Goa. Did you know- Lady Fish is rich in omega-3 fatty acids and lowers bad cholesterol and blood pressure. 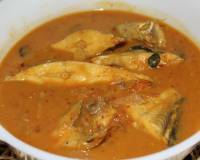 It is always good to eat fish from curries rather than deep-frying to reap its health benefits. 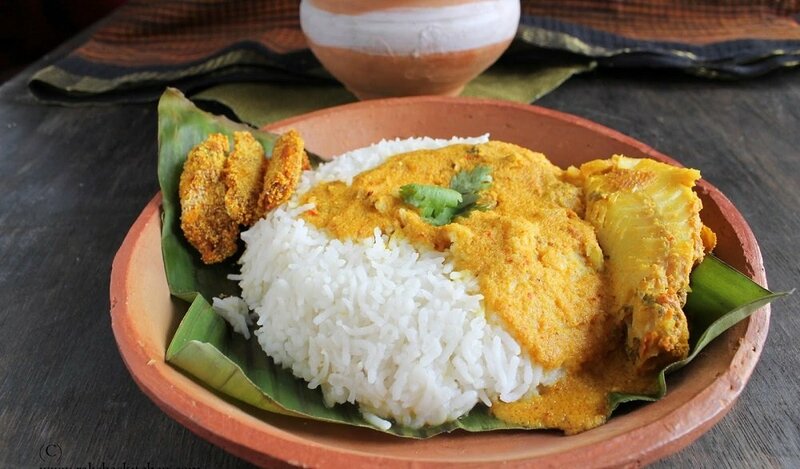 Serve Goan Lady Fish Curry either for lunch or dinner with Steamed Rice, Rava Fried Prawns, Salad and pickle and enjoy a delicious Goan meal. 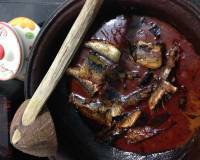 To begin making the Goan Lady Fish Curry Recipe, clean and cut the fish into 2-3 pieces. Wash and keep aside. Marinate by applying turmeric powder, red chilli powder, salt and keep it aside for a minimum of 30 minutes. Separately cut the radish into 2 inch long fingers and boil them separately. The next step is to make the gravy. Grind, grated coconut, turmeric powder, tamarind, peppercorns, coriander and red chillies by adding 1/2 cup water to make a thin gravy in a mixer grinder. In a heavy bottomed pan, add oil and fry the chopped onions till they turn brownish. Add the fish and cook on medium flame for about 2 minutes. Pour the gravy and stir. Add 1/2 cup of water in the same. Add the radish and boil for 10 minutes more by covering the utensil. Serve hot. I am originally from Goa. A Mom to a little daughter. A software engineer by profession and have a full time job at an MNC. 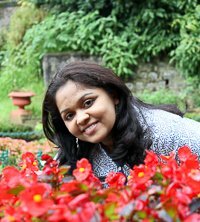 I am a passionate food blogger who loves to cook, write about food, style it and click pictures of it. 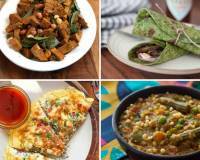 My recipes have been featured in Fortune Desi Bites, The Hindu - Young World and NDTV Good Times.